When you're looking to make a good impression on an interview how much does your clothing influence the hiring manager? More than you think. 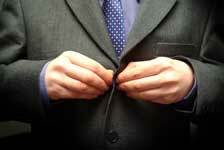 Generally speaking, dress codes in business have become more lax over the years. Whether that is a good or bad thing is beside the point. Rather, the implications of this trend present an interesting dichotomy for candidates hitting the pavement for a new position or those employees looking to make the move to the corner office. This begs the question, does your attire really have an effect on whether or not you receive that coveted promotion or dream job you so eagerly crave? Well, yes and no. Depending on the type of business you're in and the type of dress code your company has adopted more or less determines how much influence dress will play in the decision. For instance, most formal law practices require formal business attire Monday through Friday, whereas an IT start-up may only suit up when they're meeting with investors. Thus it would be highly inappropriate to show up to your interview with a law firm wearing a pair of khakis, polo and a pair of loafers. It's not so much that the hiring manager is some haute couture expert who will dismiss your qualifications for the position if you're not wearing the latest fall fashion, on the contrary. Attire during the interview process and beyond plays a significant factor because it is a representation of you and how you treat the company's culture. Which for better or worse is first identified by they type of clothing worn by employees. If you are to show up to an interview neglecting to take this into account it's probably best you don't sit around waiting for a call back, it most likely won't come. Employers are not looking to hire stylish business people instead they are looking for employees who can assume the presentation their company represents. Whether it is an IT start-up or law practice, employers want to their employees to reflect the type of company they are. We have all been advised to shine our shoes before an interview, or have our suit pressed beforehand at some point in our professional lives. Though it may sound trivial and superficial, it really does have a significant impact on the interview as a whole. In the movie, "The Pursuit of Happiness", there is a scene where Will Smith's character shows up to his final interview after completing a demanding internship with the company not wearing a shirt (following a bout of chaotic events). Though he gets the job despite this, it's important to remember that's Hollywood and this is reality, so it's probably best to dress to impress because most hiring managers are not as forgiving as those fictional characters in the movies.